The story of Alexandria reads like a Whos Who of American History. George Washington, George Mason, and Robert E. Lee are just a few famous Americans who had a hand in the heritage of a city that owes its founding to hard-working Scottish merchants. In 1669, Scotsman John Alexander purchased the land of present-day Alexandria from an English ship captain for "six thousand punds of tobacco and cask." In November 1748, three Scottish settlers, William Ramsay, John Carlyle and John Pagan, sailed up the Potomac River from Dumfries, Virginia, to look for a better trading port. They chose a site about four miles north of the creek at the public tobacco warehouses on West's Point, and petitioned the House of Burgesses to establish a town at the location. They sought the creation of a port to facilitate the shipping and trade of tobacco and other crops between the colony and Europe and England. The petition was accepted and in May of 1749, Governor Gooch signed the bill establishing the new town. It was to be called Alexandria, in honor of the Scottish Alexander family on whose land it would rise. A few months later, lots were surveyed and auctioned off on a sultry two days, July 13-14, 1749. The main thoroughfares through the new community became Fairfax Street and Cameron Street. Thus began Alexandria's 250-year history. At the time of the Revolution, Alexandria was one of the principal Colonial trading centers and ports. Alexandria's political, social, and commercial interests were of great importance to many local residents, including George Washington in neighboring Mount Vernon. Washington maintained a town house in Alexandria and served as a Trustee. He also purchased a pew in Christ Church. 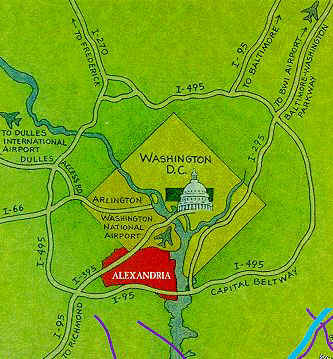 In 1789, Alexandria and a portion of Fairfax County were ceded by the State of Virginia to become a part of the newly created 10-mile-square District of Columbia. Formally accepted by Congress in 1801, Alexandria remained under the aegis of the new federal government until it was retroceded to Virginia in 1847. From their earliest days, Alexandrians have known war. George Washington drilled militia troops at Market Square in 1754, and the town served as a supply and hospital center during the Revolutionary conflict. Captured and held for ransom by the British during the War of 1812, Alexandria's warehouses were plundered by the enemy. "Light Horse Harry" Lee, a Revolutionary War general, and the father of Robert E. Lee, brought his family to Alexandria in 1810. Robert lived in Alexandria until his departure for West Point in June, 1825. In the antebellum years, industry grew and flourished and shipping through the Alexandria Canal was prosperous. During the Civil War, the City was immediately occupied by the Union military forces on May 24, 1861, and became a logistical supply center for the Federal army. Troops and supplies were transported to Alexandria via the port and the railroad and then dispersed where needed at the front. Wounded soldiers, brought back on the trains, crowded the available hospitals and temporary medical facilities in and around the town. It was during this era that several forts were constructed in Alexandria as a part of the defenses of Washington. Alexandria remained a sleepy Southern town into the 20th century. 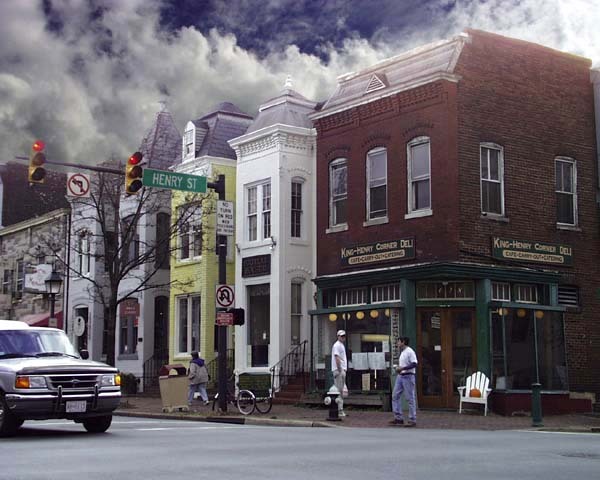 To protect its historic resources, Alexandria created an "old and historic district" in 1946. Modeled after Charleston, South Carolina's preservation ordinance, Alexandria's law created the third such historic district in the county. Alexandria increased its historic preservation and urban renewal projects in the 1960s, achieved through the cooperation of citizen activists and local government. One prime example is the Torpedo Factory. Built during World War I, it served as a United States munitions factory. Before its renovation in the late 1970s and early 1980s, its heavy industrial buildings dominated Alexandria's waterfront. Today, it serves as the Torpedo Factory Art Center and is an award winning example of adaptive reuse and the centerpiece of a lively waterfront with a marina, shops, public parks and walkways, restaurants, homes and businesses. 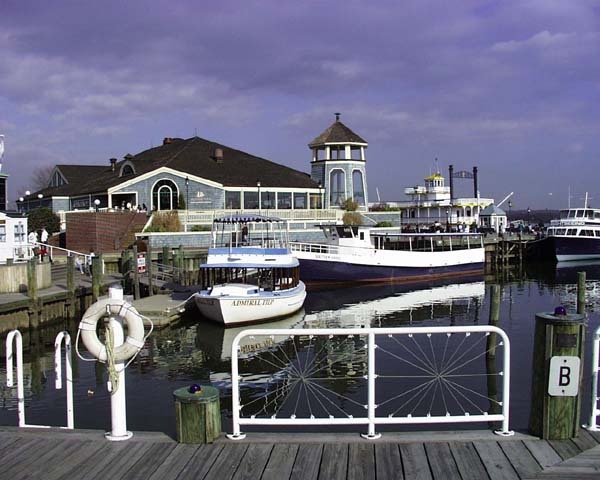 Alexandria is a popular tourist destination in the greater Washington, DC area. This year marks the 250th anniversary of the founding of the town. It retains it's charm, atmosphere and uniqueness. And, sometimes, late at night, underneath the flickering gaslamps shining over quaint cobblestone alleyways, you can still hear the echoes of Colonial times, from the resonating announcements of the town crier to the clip-clop of horses' hooves of messengers delivering the latest news of the Revolution. But how did Alexandria get its start? The answer to that question lies with the Scots. I will focus primarily on John Carlyle, and to a lesser extent, William Ramsay, to exemplify the Scottish role in Alexandria's birth and development. I will also highlight the tangible links to Alexandria's Scottish heritage that exist today in the form of historic sites and annual events. First, however, lets examine the life of one of the primary Scottish founders, John Carlyle. John Carlyle was born in Dumfrieshire, Scotland, on February 6, 1720. At age 20, seeking to make a career in business, he emigrated to Dumfries, Virginia. in 1749, along with other fellow Scottish merchants, he petitioned the House of Burgesses to establish a town 30 miles north of Dumfries. The House did, and Alexandria was born. Carlyle bought two lots during the land auction in July 1749 and served as one of the first Trustees. Carlyle purchased the choicest real estate: two adjacent lots in the center of town: one on the waterfront and the other across the street from the public square. 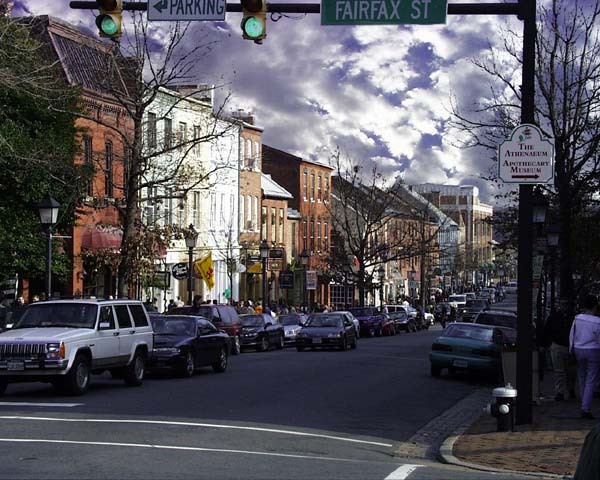 Both lots were situated on the main thoroughfares of Alexandria, Fairfax and Cameron streets. Along with a growing successful business, Carlyle sought domestic tranquility. On December 31, 1747, he married Sarah Fairfax, daughter of Colonel William Fairfax of Belvoir, and sister of Lawrence Washington's wife, Anne. Three weeks after the marriage, on January 25, 1748, he wrote Sarah's brother asking for permission to marry her - and to attempt an explanation as to why he had to marry her without permission. "She...had many other offers [from] men of very considerable fortunes that I thought delays might be dangerous. As I really loved her,...the 31st of December I was made happy ... without waiting for your approbation." One of the dominant themes of Carlyle's correspondence was his decision to live in the new world. It is mentioned in nearly half of his letters from 1745 to 1769. He decided early on, and repeatedly thereafter, that the economic opportunity of the new world was far greater than he would have enjoyed in England. In the end, his wish to see Scotland again was always identified with his loneliness for family. He tried to raise a family of his own, perhaps to alleviate some of the homesickness he felt, but success in this endeavor eluded him as much as success in business blessed him. His first two children died shortly after birth. On the death of Ann, his second child, in the spring of 1752, Carlyle said, "My loss is very great...I am so very fond of other people's children and much more of my own." While he was trying to start a family, he also began the construction of his home in 1752. Carlyle took a conspicuously different approach to building his home. He would build a large residence of special design: a country house in town. Not uncommon in his native Scotland, here his 2 1/2 stories set well back from the street would be unique. The houses' massive stone walls and red roof loomed above those of the surrounding houses, which were constructed of wood, 1 or 1 1/2 stories high, and built right on the street. Carlyle also decided to build in stone, the material of choice in his native Scotland. He chose the setting, placement and style of his new home to make a strong statement. It was one of balance and geometry, of self-sufficiency and control. There was both a reservation of privacy and a bold, public individualism. Also, Carlyle was a man who wanted to be seen. Because of its location on the main thoroughfare, most traffic arriving and departing the town would have to pass John Carlyle's house. The building of the house was not without its hardships, however. In a letter written on November 12, 1752, Carlyle mentions the difficulties of building his house, some feelings which I'm sure many of us can relate to. "I am now out of hopes of getting into my house this winter...If I had suspected it would have been what [trouble] I have met with, I believe I should have made shift with a very small house." We in Alexandria are glad he persisted. With his new house, John Carlyle had himself achieved the status of Gentleman in the properties he owned, the offices he held, the style in which he lived, and the company he kept. It is not surprising he would express this in a house set somewhat apart. When Carlyle moved into his new Alexandria home in August 1753, he wrote happily to his brother George that Sarah gave birth to a boy on the evening of August 1st - the very day they had at last moved into their house. Altogether it was, he said, "A fine beginning." Unfortunately, their elation was short lived, for only a few months later, in November, the boy died. Outside of Carlyle's private life, there were other problems facing all of Virginia and the other Colonies. War was looming on the horizon. Problems between the British and the French and Indians were beginning to heat up. England dispatched Gen. Edward Braddock to Virginia to deal with the crisis. In April 1755, Gen. Braddock chose the Carlyle House as his headquarters in Alexandria. To plan a strategy, Braddock called a meeting of the Colonial governors to meet in Alexandria. On April 13, 1755, the governors arrived: William Shirley of Massachusetts, James DeLancey of New York, Robert Hunter Morris of Pennsylvania and Horatio Sharpe of Maryland. The next day, Virginia's Governor Dinwiddie joined them. They met in the elegant Blue Room. The funding of British military campaigns in North America against the French and Indian forces was the prime topic of discussion. More important than anything coming out of the Carlyle House council was the fact of the gathering itself. It was the first of its kind in America. In a letter to his brother, John Carlyle was quite correct when he termed the Council the "Grandest Congress...ever known on this Continent." As the twentieth century historian Ross Netherton judges it: "Never before had such an influential group of leaders gathered, face to face, to plan such a grand strategy...One would have to wait twenty years to see another so grand in its participants, objectives, or results - in 1775, in Philadelphia, at Independence Hall." Perhaps as a consolation for the use of his home as headquarters, Carlyle was appointed commissary and paymaster for Braddock's entire British expeditionary force. On his appointment, Carlyle states: "The Governor...has appointed me Commissary and Paymaster to the Regiment...The post is attended with great with great trouble and fatigue and care, though little risk and the profit makes up for the fatigue." Later, however, whatever enthusiasm he felt, waned: "[My post as] Commissary...and Paymaster...is the most troublesome one I ever had..."
The entire military entourage numbered over 1,000 all of whom had been cooped up in transport ships during a long and frequently turbulent voyage from Ireland. After the troops' arrival, it only took one day for Gen. Braddock to be forced to issue orders addressing the unruly behavior of the men. As his Aide-de-Camp Lt. Robert Orme reported: "The General was very impatient to remove the troops from Alexandria, as the greatest care and severest punishments could not prevent the immoderate use of spirituous liquors..."
Along with disruptions to the residents of the burgeoning town, there must have been a considerable disruption of the Carlyle's household during the time. And Carlyle did not grow fond of Braddock. "The Generall & his Aid de Camps, Secretary & Servants Lodged with Me, he took everything he wanted, abused my home, & furniture, & made me little or No Satisfaction, tho Expressed a Great deal of Friendship for me..." Certainly Gen. Braddock achieved no successes in the field of Scottish-English relations. On April 20 the campaign began and Braddock's expeditionary force marched westward, as Carlyle stated, "to our Great joy." Carlyle remained in Alexandria to attend to his official duties and it's probably good that he did. On July 9, Braddock and his men were marching though the dense woods after leaving Fort Necessity on the forks of the Ohio River. While still in the forest and formed in a long column, they suddenly stumbled into a body of French and Indians. Both sides were surprised, but the French and Indians reacted quicker and began to effectively cut up the British. For the British, unable to maneuver by column into line and with little training in fighting as individuals, the day was a disaster. A young Washington organized a withdrawal. Braddock, however, fell mortally wounded and died five days later. He was buried in the line of march to conceal the grave's location and to prevent the enemy from desecrating the body. Carlyle called the disaster "...the most remarkable Drubing that we have In history." He later states that "the British Soldiers [were] Seased with Such a Panick At the Indian Method of fighting, that they are determined to Go into Winter Quarters in July..." and then notes in paranthesis with a touch of Scottish sarcasam, "(brave English Men)..."
Back in Alexandria, John Carlyle fell gravely ill, probably with scarlet fever, and was forced to resign as commissary and paymaster. After recovering, he returned to the building of his estate and family, but those areas were as filled with hardships as his other endeavors. Carlyle had four more children between July 1755 and January 1761, only one of which, Ann, his seventh, survived. It might have been cause for celebration, if not for the fact that Sarah, his wife, died from complications of the childbirth the following day. Carlyle married Sybil West later that same year on December 22. Unfortunately, the pattern established with his first wife continued. The first two children of Carlyle and his second wife, Sybil, both died in infancy, the second dying after only four days. Then, on May 27, 1766, Sybil gave birth to a son, George, who survived. George, however, would not live to manhood, as he was killed in the Battle of Eutaw Springs in 1781 at the age of 15. A little less than three years later, on March 7, 1769, while giving birth to their fourth child, Sybil also died in childbirth. It was indeed a tough time for Carlyle, as he wrote in a letter on December 12, 1769: "I live a disagreeable life and keep little company...Death has been very common in my house since Mrs. Carlyle was taken from me." Carlyle did have his daughter, Ann Fairfax, however, to comfort him. She married Henry Whiting in October 1775. That daughter Ann Whiting, however, died in childbirth on March 21, 1778. During his last years, John Carlyle continued with his many merchant and business interests. He died in September 1780 and was buried in the churchyard of the Presbyterian Meeting House, a church that he built six years earlier in 1774. After John Carlyle's death, his house went through many owners and uses. In 1855, a four-story hotel was built immediately in front of the Carlyle House. Although still visible from Lee Street behind it, the house now vanished from Fairfax Street. It also began to deteriorate. In 1887, a visitor wrote: "the Carlyle House...stands, doors wide open...a deserted, dismantled, dilapidated house, the plaster loosened from the ceilings and the rats its only inhabitants." The hotel and house were converted into apartments before one owner decided to refurbish it and turn it into a museum around the time of World War I. Attempting to overcome the downtown blight which afflicted so many cities, Alexandria began a sweeping program of urban renewal in the 1960s. Although the early stages featured the destruction of many Colonial era buildings, other sites were chosen to be preserved instead of demolished and rebuilt. The Carlyle House was one of them. The site was to be turned into an open space, a public park that would add greenery to downtown rather than a block of stores behind a brand new "colonial" façade. The hotel in front of the Carlyle House was torn down in 1973 and the house was restored. It opened in 1976 in time for the nation's bicentennial. Today, it exists as a museum and offers a fine example of an 18th century home, complete with many of Carlyle's furnishings. Visitors can once again stand in the majestic blue room where Carlyle stated, the "Grandest Congress...ever known on this Continent" met. The Carlyle House is open every day except Monday with guided tours every half-hour. Another site that exists today that is linked to one of the Scottish founders is William Ramsay's House. Known as the Romulus of Alexandria, William Ramsay was another of the influential Scots that played a key role in the creation and development of the town. He was born in 1716 in Galloway, Scotland. He emigrated to Dumfries, Virginia, on the Potomac River in 1742. He was, along with John Carlyle, one of the major proponents to establishing a town in the area that became Alexandria. He became one of the first trustees and purchased several lots at the first public auction. According to tradition, Ramsay barged a small clapboard house, constructed in 1724 in Dumfries, up the Potomac River and placed it on his lot, number 47. It is thought that he placed the house facing toward the river so he could watch his trading vessels sail in and out of the harbor. There is another tradition that I have not found any evidence to support, but it states that Ramsay was a very competitive person and sought to be the first person to have a house in the new town. Hence, the barge method. After establishing himself, he engaged in the export-import trade and did very well. He was good friends with George Washington, who was a frequent visitor to his home. His wife, Ann McCarty, a cousin of George Washington through his mother's family, conducted fund-raising campaigns totaling $75,812 for Washington's forces in the Revolutionary War. She was appointed treasurer of Alexandria and Fairfax County for the fund raising effort. Thomas Jefferson praised her efforts by saying, "that the amount collected was large and greatly to her credit, and let us give her all due honor for that work..."
William Ramsay served Alexandria as a public servant for some 36 years as a town trustee, census taker and member of the Committee of Safety. He was one of the first merchants to build wharves in front of the town. On St. Andrew's Day in 1761, the citizens of Alexandria voted Ramsay the first and only Lord Mayor of Alexandria, a largely honorary title. The ceremony was not without its fanfare. It was described by the Maryland Gazette as including "a grand procession...with drums, trumpets, a band of music and colors flying...In the evening a ball was given at which...[a] ...brilliant company of ladies danced. The night concluded with bounties, illuminations and other demonstrations." Ramsay died in 1785, at the age of 69. His friend, George Washington, walked in his funeral and attended his burial at Christ Church. The Alexandria City Council, in anticipation of the 200th Anniversary of the City in 1949, purchased the Ramsay House for restoration and conversion to a public museum. Now, it serves as the City's Visitors Center and my office. It is open every day 9 a..m. to 5 p.m. except Christmas Day and New Years Day. A guided walking tour of Old Town Alexandria leaves every day from the Ramsay House garden at noon. Another building which stands today as a monument to the Scottish founders is the Old Presbyterian Meeting House. The Old Presbyterian Meeting House was built by John Carlyle in 1774. When Washington died, Dr. James Craik, his doctor, gave instructions to toll the bell in the steeple, the only church bell in Alexandria at the time. It tolled until the burial at Mount Vernon took place four days later. It was the site of the Masonic memorial service for Washington on December 27, 1799. This year, on December 29, 1999 there will be a reenactment this service at the Old Presbyterian Meeting House. It will feature Colonial music and attire and the original service delivered by Rev. Dr. James Muir, a friend of George Washington. A small graveyard in back of the church contains the graves of many of Alexandria's prominent citizens including John Carlyle and his first wife Sarah, Colonel Dennis Ramsay, son of William Ramsay, Dr. James Craik, Washington's physician, and the Tomb of the Unknown Soldier of the Revolutionary War. Alexandria celebrates its rich Scottish heritage with two major events annually: the Scottish Christmas Walk in December and the Virginia Scottish Games in July. The Campagna Center's Annual Scottish Christmas Walk Weekend parade honors the city's Scottish heritage. In total, more than 100 Scottish clans dressed in traditional tartans and playing bagpipes march through the historic streets of the city, along with reenactment units, pipe and drum corps, dog clubs & antique cars. The Annual Virginia Scottish Games and Festival, one of the nation's largest exhibitions of Scottish culture. The Games feature a Retreat Parade with bagpipe bands and the Baltimore Scottish Color Guard. The U.S. National Highland Heptathlon makes this event a top draw for the Celtic world. Highland dancing, one of the most colorful attractions, includes hundreds of competitors. The weekend also features a British antique automobile show, Scottish breed dog events, clan tents, and a grand parade of Scottish clans. Another link to Alexandria's Scottish heritage is her sister city in Scotland, Dundee. Situated on the banks of the River Tay, Dundee began as a trading port and then became a wool and linen center. Later, the development of the shipbuilding and railroad industries made Dundee one of Britain's largest whaling ports. Although the great industries of the 19th century have largely disappeared, the city has adapted to the late twentieth century by clearing or refurbishing the old industrial areas for housing, small businesses and the arts and leisure uses. The new use makes the most of its attractive location by developing a wide range of facilities for tourists to Scotland. In many ways, the life and evolution of Dundee mirrors that of Alexandria. It retains its historic character, but has adapted itself to the times and flourishes today. And so, I encourage you, for those who haven't yet experienced Alexandria to come and have a visit. See for yourself the quaint brick-laid and cobblestone streets, the magnificent architecture and historic sites. Visit the homes of John Carlyle or William Ramsay or attend an annual event that celebrates Alexandria's Scottish heritage, or simply stroll the streets of the town that Scottish determination helped build. Their efforts still stand today.